Abstract: Technology for the modern commuter, Airwheel A6S power chair can take you to your favourite destinations within minutes by simply leaning forward and pushing controller. Enjoy an effortless and innovative visit to your long expected city with Airwheel mars rover. Still worried about global warming and environment pollution? A simple change can reduce your emissions greatly. Go green with Airwheel. In addition to electric unicycles and self-balancing electric scooter, electric skateboard, Airwheel keeps on innovation and upgrading the design to satisfy more individuals' requirements. Airwheel A6S electric power wheelchair is a modern and fashionable personal transport that will efficiently get you to A to B in no time. More convenient and easier way of personal transportation in senior citizens' everyday life, it is the A6S motorized wheelchair. Minimalist industrial design and large wheels are the distinct features of Airwheel A6S. However, its design simplicity does not forego unparalleled riding comfort, guaranteed by the cutting-edge materials. 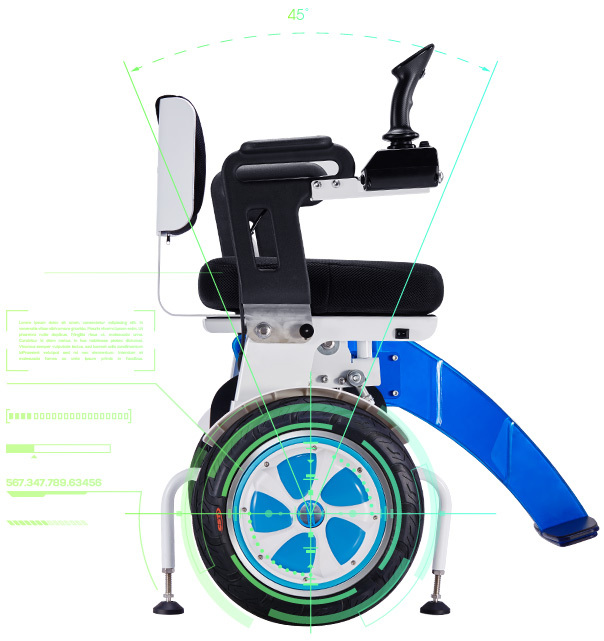 The sitting posture to control Airwheel A6S folding power chair makes the riding is no long a laborious process. Adopting large wheels and dual motors, which provide strong power with steady and continuous power output, A6S is able to adapt to urban conditions. There is a smooth riding even on meandering and bumpy roads. Also, there are some other features will appeal to moms, such as the joystick controller, LED display and App etc. The controller of Airwheel A6S foldable mobility wheelchair can be placed in right or left according to riders' habits. There is a super large LED display on the controller that shows the real-time riding data. Also, riders can stops anywhere, anytime with the high quality front and rear kickstands making it park stably and safely. The embedded headlight will illuminate the dark environment to ensure a safe ride. The rear intelligent light will light automatically if brake to remind the rear vehicles and passers-by. The Airwheel self-balancing wheelchair is their great helper, not only help them to travel freely, but also bring fun to their daily life. Faster than walking, greener than driving, it is energy-efficient. The world is happening around you. Get outside and experience it. Visit your city from another perspective with Airwheel A6S smart chair.